Interview With a Leading SEO Expert About Legal Marketing Solutions - SEO Eblog by SEO Advantage, Inc. Recently, I had the pleasure of interviewing Wes Reunig, Sales Director and Executive Vice President at SEO Advantage (SEOA). Wes and his brother Stone created SEOA in 1999 following years of working together in business services and consulting, including SEO long before Google became the dominant search engine. The mere fact SEOA has survived and thrived in its own fiercely competitive market is impressive, but what sets this company apart is its philosophy that a one-size-fits-all approach to SEO and online marketing is unrealistic. Wes gave an excellent example that a personal injury attorney faces far more competition in their niche than a real estate attorney. Different markets require distinct SEO and online marketing strategies. I asked Wes a few questions about how he approaches online marketing and SEO for law firms as the leader of the attorney-focused division of SEO Advantage, SEO Legal. Wes explained that SEO in the legal field is driven by keywords, practice and geography. Attorneys need a comprehensive partner that can do it all—web design, SEO, content creation, social media, link building, usability and more. 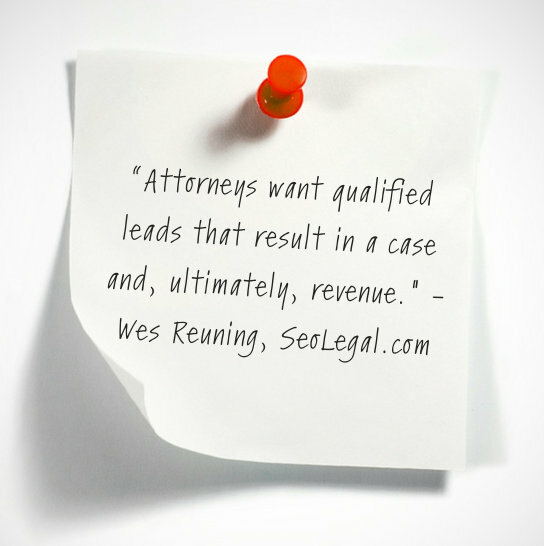 “Attorneys want qualified leads that result in a case and, ultimately, revenue. It’s easy for us to prove our value to the legal market in getting those results,” Wes says. Read my interview with Wes to learn more about successful SEO and online marketing tactics in the legal market.